Abstract: Organic farming is believed by many to be an environmentally friendly production system that promotes the use of local forage while strongly limiting the input of chemicals, including allopathic treatments. As organic dairy farming has grown, farmers have realised that many available conventional breeds of cow are not well adapted to the new situations and that more ‘robust’ cows, able to function well in the constraining organic environment, are needed to yield acceptable longevity and productivity. In this review paper, the current breed diversity in organic dairy farming is analysed with the aim of identifying the types of cow that would best fulfil organic breeding goals. Unlike the conventional sector, organic dairy farming is very heterogeneous and no single type of cow can adapt well to all scenarios. There are advantages and disadvantages to the use of existing breeds (rustic Holstein-Friesian, other rustic breeds and crosses), and strong genotype × environment interactions demand different strategies for very diverse situations. Organic dairy farms producing milk for systems that recompense milk volume would benefit from using higher milk yielding cows, and rustic Holstein-Friesian cows may be the best option in such cases. Although most Holstein-Friesian cows are currently selected for use in conventional systems, this situation could be reversed by the implementation of an organic merit index that includes organic breeding goals. Farms producing milk either for systems that recompense milk solids or for transformation into dairy products would benefit from using breeds other than Holstein-Friesian or their crosses. Organic farmers who focus on rural tourism, farm schools or other businesses in which marketing strategies must be taken into account could benefit from using local breeds (when possible) or other rustic breeds that are highly valued by consumers. Abstract: The objective of this study was to establish different single or multiple trait selection indices to calculate genetic and economic gains by combining some production, reproduction and udder health traits in a population similar to the overall practical situation in Iran, with and without imposing restrictions on genetic change for some traits. The SelAction software was used to perform the analyses based on selection index theory through a deterministic model. Results indicated that among established indices, the index that showed the highest genetic gain for milk yield did not maximize the total genetic and economic gains. Rather, the index that included all production, reproduction and udder health traits yielded the highest genetic and economic gains. When we placed restriction on the selection indices, the economic gain decreased and the amount of reduction depended on the heritability and the correlation of restricted trait(s) with other traits. Generally, regarding the economic genetic gain per generation, the indices based on records of 200 offspring were 4.819% more efficient than those that used information of 100 offspring. Abstract: The main objective of this study was to compare the performance of different ‘nonlinear quantile regression’ models evaluated at the τth quantile (0·25, 0·50, and 0·75) of milk production traits and somatic cell score (SCS) in Iranian Holstein dairy cows. Data were collected by the Animal Breeding Center of Iran from 1991 to 2011, comprising 101 051 monthly milk production traits and SCS records of 13 977 cows in 183 herds. Incomplete gamma (Wood), exponential (Wilmink), Dijkstra and polynomial (Ali & Schaeffer) functions were implemented in the quantile regression. Residual mean square, Akaike information criterion and log-likelihood from different models and quantiles indicated that in the same quantile, the best models were Wilmink for milk yield, Dijkstra for fat percentage and Ali & Schaeffer for protein percentage. Over all models the best model fit occurred at quantile 0·50 for milk yield, fat and protein percentage, whereas, for SCS the 0·25th quantile was best. The best model to describe SCS was Dijkstra at quantiles 0·25 and 0·50, and Ali & Schaeffer at quantile 0·75. Wood function had the worst performance amongst all traits. Quantile regression is specifically appropriate for SCS which has a mixed multimodal distribution. Abstract: This study aimed to calculate economic values (EVs) and economic selection indices for milk production systems in small rural properties. The traits 305-d milk yield in kg (MY), fat (FP) and protein (PP) percentage, daily fat (FY) and protein (PY) yield, cow live weight in kg (LW), calving interval (CI), and logarithm of daily somatic cell count (SCC) in milk were considered the goals and selection criteria. The production systems were identified from 29 commercial properties based on the inventory of revenues and costs and of zootechnical field data. Later, bioeconomic models were developed to calculate the productive performance, revenues, and costs concerning milk production to estimate EVs, which were calculated as the difference in annual profit with dairy production resulting from a change in one unit of the trait while keeping the others constant and dividing the value by the number of cows. After the EVs were known, ten economic selection indices were estimated for each system so they could be compared by modifying the selection criteria and calculating the relative importance of each selection criteria, the accuracy of the economic selection index, and response expected to the selection in USD, among other parameters. One of the systems detected was called less intensive (LS) and was characterized by having ten cows in lactation that produced 13·5 l/d and consumed 1·8 kg of concentrate/d. The second system detected was called more intensive (IS) and had 22 cows in lactation that produced 17·5 l/d and consumed 3·4 kg of concentrate/d. Monthly profits per cows in lactation of USD 2·60 and USD 68·77 were recorded for LS and IS, respectively. The EVs of the traits MY, FP, and PP were all positive, while for the other traits they were all negative in all situations. The best economic selection indices were those featuring selection criteria MY, LW, and CI, while the trait LW had the greatest importance in both systems. These results indicate that animal frame must be controlled in order to maximize the system's profit. Abstract: We address the hypothesis that individual cow feed intake can be measured in commercial farms through the use of a photogrammetry method. Feed intake and feed efficiency have a significant economic value for the farmer. A common method for measuring feed mass in research is a feed mass weighing system, which is excessively expensive for commercial farms. However, feed mass can be estimated by its volume, which can be measured by photogrammetry. Photogrammetry applies cameras along the feed-lane, photographing the feed before and after the cow visits the feed-lane, and calculating the feed volume. In this study, the precision of estimating feed mass by its volume was tested by comparing measured mass and calculated volume of feed heaps. The following principal factors had an impact on the precision of this method: camera quality, lighting conditions, image resolution, number of images, and feed density. Under laboratory conditions, the feed mass estimation error was 0·483 kg for heaps up to 7 kg, while in the cowshed the estimation error was 1·32 kg for up to 40 kg. A complementary experiment showed that the natural feed compressibility causes about 85% of uncertainty in the mass estimation error. Abstract: This research communication addresses the goal of validating an algorithm to monitor natural occurrence of feeding behaviours in dairy Mediterranean buffalo based on the output of a noseband pressure sensor (RumiWatch®, halter). Several characteristics of the feeding behaviour were detected with a very high (ruminating boluses), high (chews per bolus) and moderate degree of correlation (chews per minute) with video analyses (gold standard). All of them were associated with a low mean difference with the gold standard, and the mean relative measurement error ranged between low (ruminating boluses) and moderate (chews per bolus and chews per minute). The proportion of correctly detected events for the variables rumination and eating time was 98 and 99%, respectively. The collection of data and subsequent evaluation of the parameters investigated may provide objective information on Mediterranean Buffalo behaviours allowing for reliable studies of the animal welfare in this ruminant in the future. Abstract: In a system in which cows are grouped and given differential access to feeding bins with different rations, and where these groups change over time, it is important to find out how a change in the ration (and hence feeding bin) affects the cow's feeding behaviour. Monitoring the locomotion of cows can be used to predict oestrus and improve health (lameness diagnosis), but activity monitors can also be used to estimate both activity and numbers of feeding visits by cows. Ice tag activity monitors were attached to the right hind legs of ten cows. Walking, standing, lying data and health records were used to record changes before and after a change in each cow's feeding bin. Results comparing activity before and after feeding bin change revealed significant increases in motion index, number of steps taken per minute and number of lying bouts per minute (all P < 0.001). Comparing the behaviours of cows subsequently followed during the dry period showed significant differences in motion indices and number of steps taken per minute (P < 0.001) in the dry period. The results indicate that cows are affected by feeding bin change and group change, which can lead to an increase in behaviour associated with the stress response, especially in heifers. Abstract: The aim of this study was to determine the effect of diet supplemented with selenized yeast (Se-yeast) on milk yield and milk composition of goats and expression of casein and mammary-gland-immune system genes in milk somatic cells (MSC). Twenty-four dairy goats in their second to fourth lactations were divided into control and experimental groups, balanced according to lactation number and breed (Polish White or Fawn Improved). Morning milk and blood samples were collected four times during lactation (on the 21st, 70th, 120th, 180th day after kidding). The control and experimental groups were fed diets with 0.7 mg inorganic Se/goat/day (sodium selenite) or 0.6 mg organic Se/goat/day (selenized yeast), respectively. Milk, fat and protein yields during lactation as well as average somatic cell count, fat, protein and lactose contents in milk were evaluated. Microelements in milk and blood serum and biochemical parameters in blood serum were determined at the beginning and the end of the experiment. The expression levels of the genes encoding αS1-casein (CSN1S1), αS2-casein (CSN1S2), κ-casein (CSN3), interleukin 8 (IL-8), serum amyloid A3 (SAA3), interleukin 1β (IL-1β), bactenecin 7.5 (BAC7.5), bactenecin 5 (BAC5), β2-defensin (GBD2), hepcidin (HAMP), chemokine 4 (CCL4), tumour necrosis factor α (TNFα), toll-like receptor 2 (TLR2), cathelicidin-7 (MAP34) and cathelicidin-6 (MAP28) were determined in MSC. Milk, fat, and protein yields were higher and somatic cell count (SCC expressed as natural logarithm) was lower in the milk of goats fed organic Se. The Se concentration in milk was twice as high in the organic vs. inorganic treatment groups at the end of the experiment, while there were no differences in studied biochemical parameters between groups. The transcript levels of CSN1S2 and BAC7.5 were higher and IL-8 was lower in MSC of Se-yeast treated groups. Such results may indicate better health status of mammary glands of goats treated with organic Se as well as positive impact of selenized yeast on the goat's milk composition. Differences in the IL-1β and IL-8 transcript levels were also noted between the stages of lactation, with the highest expression at the peak of lactation (day 70), highlighting the metabolic burden at this time. We concluded that the Se-yeast supplementation improved the productivity and health status of goats and could have significant economic impact on farmer's income. Abstract: This research paper addresses the hypothesis that calcium salts combined with whole linseed and heat-treated rapeseed cake in one feed additive may efficiently stimulate the productivity of dairy cows and have a positive effect on the functional (health-promoting) properties of milk fat. The article proposes the composition of such an additive (EFA) and evaluates its nutritional effect in the diet of mid-lactation dairy cows. Forty multiparous Polish Holstein-Friesian (PHF) dairy cows were allocated to one of four treatments (10 cows/treatment) and fed a TMR diet without EFA or with EFA in the amount of 1, 2 or 3 kg/d per head for a 63-d-period. Individual intake of dry matter (DMI) and nutrients was determined, as was milk yield and composition, including fatty acid profile, fat soluble vitamins, cholesterol and phospholipids (PLs). Irrespective of the treatment group, cows fed diets with EFA had higher (P < 0.05) DMI, milk yield and milk vitamin D3 and K2 concentration but lower (P < 0.01) milk protein, fat and cholesterol contents. The additive did not affect the milk concentrations of β-carotene or vitamin A or E. The PLs content was correlated with fat concentration in the milk and decreased as the level of EFA in the diet increased. An increase in phosphatidylcholine in total PLs was accompanied by a reduction in the proportion of sphingomyelin (P < 0.05). The use of EFA increased the proportion of polyunsaturated fatty acids (PUFA) in the total fatty acids in the milk. The addition of EFA in the amount of 3 kg increased the proportion of PUFA by 77% (P < 0.05). In conclusion, the use of an energy-protein feed additive (EFA) increases feed intake and milk yield in cows and alters milk fat composition, improving its functional properties. Higher milk production compensates for the decrease in solids concentration in the milk, which has no effect on their daily yield. Abstract: In this research communication we used digital gene expression (DGE) analysis to identify differences in gene expression in the mammary glands of dairy cows between early lactation and the mid-dry period. A total of 741 genes were identified as being differentially expressed by DGE analysis. Compared with their expression in dry cows, 214 genes were up-regulated and 527 genes were down-regulated in lactating cow mammary glands. Gene Ontology analysis showed that lactation was supported by increased gene expression related to metabolic processes and nutrient transport and was associated with decreased gene expression related to cell proliferation. Pathway mapping using the Kyoto Encyclopedia of Genes and Genomes showed that 579 differentially expressed genes had pathway annotations related to 204 pathways. Metabolic pathway-related genes were the most significantly enriched. 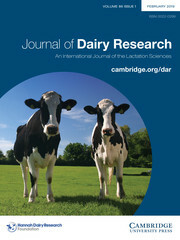 Genes and pathways identified by the present study provide insights into molecular events that occur in the mammary gland between early lactation and mid-dry period, which can be used to facilitate further investigation of the mechanisms underlying lactation and mammary tissue remodeling in dairy cows. Abstract: Dairy cows with ketosis display severe oxidative stress as well as high blood concentrations of non-esterified fatty acids (NEFA) and β-hydroxybutyrate (BHB). Cytochrome P4502E1 (CYP2E1) plays an important role in the induction of oxidative stress. The aim of this study was to investigate CYP2E1 expression and activity in the liver of clinically ketotic cows (in vivo) and the effects of NEFA and BHB on CYP2E1 expression and activity in hepatocytes (in vitro). Dairy cows with clinical ketosis exhibited a low blood concentration of glucose but high concentrations of NEFA and BHB. Hepatic mRNA, protein expression, and activity of CYP2E1 were significantly higher in cows with clinical ketosis than in control cows. In vitro, both NEFA and BHB treatment markedly up-regulated the mRNA and protein expressions as well as activity of CYP2E1 in cow hepatocytes. Taken together, these results indicate that high levels of NEFA and BHB significantly up-regulate the expression and activity of hepatic CYP2E1, and may be influential in the induction of oxidative stress in cows with clinical ketosis. Abstract: Dairy cows with fatty liver or ketosis display decreased insulin sensitivity and defects in the insulin receptor substrate (IRS)/PI3K/AKT signaling pathway. Phosphatase and tensin homolog (PTEN) is a well-known tumor suppressor and also a negative regulator of insulin signaling and peripheral insulin sensitivity. We investigated the hypothesis that PTEN may affect the insulin pathway-mediated hepatic glucose and lipid metabolism in dairy cows. Adenovirus vectors that over-express and silence PTEN were constructed, and then transfected into hepatocytes isolated from calves to investigate the effect of PTEN on PI3K/AKT signaling pathway. PTEN silencing increased the phosphorylation of AKT and the expression of PI3K but decreased the phosphorylation of IRS1, which increased the phosphorylation levels of glycogen synthase kinase-3β (GSK-3β) and expression of sterol regulatory element-binding protein-1c (SREBP-1c). Increased GSK-3β phosphorylation further up-regulated expression of the key enzymes phosphoenolpyruvate carboxykinase (PEPCK) and glucose-6-phosphatase (G6-Pase) involved in gluconeogenesis. Furthermore, the expression of SREBP-1c target gene fatty acid synthase (FAS) also increased significantly. We further showed that PTEN over-expression could reverse the above results. PTEN negatively regulates the enzymes involved in hepatic gluconeogenesis and lipid synthesis, which suggests that PTEN may be a therapeutic target for ketosis and fatty liver in dairy cows. Abstract: This research communication describes how different detachment levels (0.48, 0.3 and 0.06 kg milk/min) at the quarter-level affect milk flow profiles and overall milking efficiency in automatic milking systems. We hypothesized a higher detachment level would result in greater mean flow rates without affecting the volume of harvested milk per cow during 24 h compared to lower detachment levels. The data suggest milk flow decreased to a rate below the overmilking limit within the 6-s delay time required for termination in all treatments, but the duration of overmilking was shorter for the greatest detachment level compared to the other treatments. We conclude that setting a detachment level at a greater milk flow rate reduces the duration of overmilking without affecting the amount of milk harvested when applied to cows in mid-lactation during quarter-level milking. We also suggest that the steepness of the decline phase of the milk flow curve might have a larger effect than the actual detachment level on the duration of overmilking. Abstract: The bovine whey consists of more than 200 different types of proteins, of which β-lactoglobulin, α-lactalbumin, serum albumin, immunoglobulins and lactoferrin predominate. However, their concentrations are not stable due to the existence of protein dynamics during a transition from colostrum secretion to mature milk. To evaluate the dynamics of whey proteins of Jersey cows during a colostral phase and first month of lactation and an influence of the number of lactations, 268 milk samples from 135 Jersey cows were selected through a clinical evaluation. Whey was obtained by rennet coagulation of the mammary secretion. The concentration of total proteins was determined by the biuret method and their fractions were identified by 12% dodecyl sulfate-polyacrylamide gel electrophoresis (12% SDS-PAGE). Maximum concentrations of all protein fractions were observed in the first 12 h of lactation, reducing over the course of the study. Modification of the protein predominance was also observed. The transition from colostrum secretion to milk occurred between 24 and 72 h postpartum. There was an influence of the number of lactations on the dynamics of whey proteins, indicating that multiparous cows had better immunological and nutritional quality when compared to primiparous cows. Abstract: Current available methods to detect cow milk adulteration or accidental contamination of goat milk are both laborious and time consuming. The aim of this technical research communication was to develop a simple, rapid, specific and sensitive method for quantitative detection of cow milk in goat milk. A competitive lateral flow immunoassay (LFIA) strip was developed using a specific monoclonal antibody (mAb) labeled with colloidal gold nanoparticles (GNPs) for specifically binding to cow milk casein. The detection limit of this rapid detection was 0.07% of cow milk in goat milk, providing equal specificity and higher sensitivity when compared with a commercial enzyme-linked immunosorbent assay (ELISA). These result suggest that the established rapid GNPs-LFIA strip could be used for monitoring cow milk adulteration/contamination of goat milk. Abstract: The aim of this Research Communication was to contribute to the knowledge of milk sialic acid concentration of bovines with specific focus on India. Sialic acids (SA) are important constituents of mammalian milks. Buffaloes are the main milk producing species in India, therefore, our research focused on both cow and buffalo. Two Indian cattle (Bos indicus) breeds (Sahiwal, Tharparkar), one cross bred cattle – Karan Fries (Tharparkar × Holstein Friesian) and a buffalo breed (Murrah) were selected. Systematic comparisons of the total, free and bound form of SA and also its distribution over the course of lactation- colostrums and mature milk (120–140 d) was generated. Animal management, sample collection and methodology of SA estimation were identical for the different groups. Colostrum had the highest concentration of SA, which declined with the progress of lactation in all the groups. Majority of the SA existed in bound form. No significant (P < 0.05) difference was recorded in the total, bound or free SA across all the groups. However, differences were obvious in the total and bound SA level in the mature milk. Indian cattle, Sahiwal and Tharparkar were equivalent, but had higher concentration of total and bound SA than crossbred cattle. Milk of buffalo had SA equivalent to that of crossbred cattle. The mean (se) levels of total SA was 23.4 (0.8), 25.8 (2.4), 20.3 (0.6) and 20.2 (1.2) in Sahiwal, Tharparkar, cross bred and Murrah buffalo, respectively. The findings suggested that milk of indigenous cattle may be a potential source of SA, a bioactive compound with beneficial effect on human health and a potential functional ingredient in foods. Results add value to the currently declining indigenous cattle of India. Abstract: The objective of the studies reported in this research communication was to investigate the use of whey contaminated with antibiotics such as cephalosporins, quinolones and tetracyclines as a nutrient medium for the growth of Kluyveromyces marxianus with particular attention to the effect of thermal treatment used to overcome the inhibitory effects of antibiotic concentrations close to the Maximum Residue Limits. The heat treatments at 120 °C for 40 min, 120 °C for 83 min, and 120 °C for 91 min caused total inactivation of cephalosporins, tetracyclines and quinolone residues in whey respectively. Abstract: The process of agglutination causes firm cream layers in bovine milk, and a functioning agglutination mechanism is paramount to the quality of non-homogenized milks. The phenomenon is not well-described, but it is believed to occur due to interactions between immunoglobulins (Ig) and milk fat globules. For the first time, this paper demonstrates how the process of agglutination can be visualized using confocal laser scanning microscopy, rhodamine red and a fluoresceinisothiocynat-conjugated immunoglobulin M antibody. The method was used to illustrate the effect on agglutination of storage temperature and pasteurization temperature. Storage at 5 °C resulted in clearly visible agglutination which, however, was markedly reduced at 15 °C. Increasing storage temperature to 20 or 37 °C cancelled any detectable interaction between IgM and milk fat globules, whereby the occurrence of cold agglutination was documented. Increasing 20 s pasteurization temperatures from 69 °C to 71 °C and further to 73 °C lead to progressively higher inactivation of IgM and, hence, reduction of agglutination. Furthermore, 2-dimensional sodium dodecyl sulfate polyacrylamide gel electrophoresis showed that changes in storage temperature caused a redistribution of Ig-related proteins in milk fat globule membrane isolates. Poly-immunoglobulin G receptor was present in milk fat globule preparations stored at cold (4 °C) conditions, but absent at storage at higher temperature (25 °C). The findings provide valuable knowledge to dairy producers of non-homogenized milk in deciding the right pasteurization temperature to retain the crucial agglutination mechanism. Abstract: The experiments reported in this research paper examine the potential of digestion using acidic enzymes Protease A and Protease M to selectively hydrolyse α-lactalbumin (α-La) whilst leaving β-lactoglobulin (β-Lg) relatively intact. Both enzymes were compared with pepsin hydrolysis since its selectivity to different whey proteins is known. Analysis of the hydrolysis environment showed that the pH and temperature play a significant role in determining the best conditions for achievement of hydrolysis, irrespective of which enzyme was used. Whey protein isolate (WPI) was hydrolysed using pepsin, Acid Protease A and Protease M by randomized hydrolysis conditions. Reversed-phase high performance liquid chromatography was used to analyse residual proteins. Regarding enzyme selectivity under various milieu conditions, all three enzymes showed similarities in the reaction progress and their potential for β-Lg isolation. Abstract: The aim of this work was to evaluate the impact of two factors on the ripening profiles of hard cooked cheeses: (F1) the growth medium for the primary and adjunct cultures, constituted by autochthonous strains: Lactobacillus helveticus 209 (Lh209) and Lactobacillus paracasei 90 (Lp90), respectively, and (F2) the addition of L. paracasei Lp90 as adjunct culture. Four types of cheeses were made: W and M cheeses in which only Lh209 was added after its growth in whey and MRS, respectively; Wa and Ma cheeses in which both strains (Lh209 and Lp90) were added after their growth in whey and MRS, respectively. Physicochemical and microbial composition, proteolysis and profiles of organic acids and volatile compounds were analyzed. According to the methodology of the cultures preparation, W and Wa cheeses showed a higher level of secondary proteolysis and lower level of primary proteolysis (P < 0·05), lower content of citric and acetic acids and higher amount of propionic acid (P < 0·05), in comparison with M and Ma cheeses. The incorporation of Lp90 increased the secondary proteolysis (P < 0·05), decreased the citric acid (P < 0·05), and increased the propionic acid only when was added after their growth in whey (P < 0·05). Both factors significantly modified the percentages of the volatile compounds grouped in chemical families; in addition, for the half of the compounds detected, significant differences were found. Based on the obtained results, the use of Lp90 as an adjunct in hard cooked cheeses, and the preincubation of the cultures in whey are strategies to accelerate the cheese ripening and to enhance the production of some characteristic compounds of this type of cheeses, such as propan-2-one, hexan-2-one, 2- and 3-methyl butanal, heptan-2-ol, acetic and 3-methylbutanoic acids and 3-hydroxy butan-2-one. Abstract: We evaluated the effect of in vitro digested milk on mature adipocytes 3T3-L1, paying particular attention to its fatty acid composition, and comparing human (HM), donkey (DM), bovine (BM), ovine (OM), caprine (CM) and formula (FM) milk. Cellular viability, apoptosis, oxidative response and gene expression levels of NF-κB p65, HMGB1, SREBP-1c and FAS were evaluated. Digested milk treatments significantly reduced 3T3-L1 mature adipocytes viability and caspase activity compared with control group, but no significant differences were observed among different sources of digested milk. In all digested milk samples, ROS level was higher than the control, however, the digested human and formula milk showed lower levels of ROS than DM, BM, OM and CM samples. Lower capacity of HM and FM to induce oxidative stress in mature adipocytes was ascribed to the peculiar free fatty acids profile of digested milk samples. All milk treatments elicited a significant over-expression of NF-κB p65 in 3T3-L1 adipocytes compared to the control; the lowest gene expression was found in HM, BM, OM and CM, the highest in FM and an intermediate behavior was shown in DM. All digested milk treatments influenced the gene expression of SRBP-1c with FM and HM showing the highest levels. For FAS expression, BM showed the highest level, OM and CM intermediate and FM, HM and DM the lowest levels, however HM and DM had comparable levels to the control.